Enjoy these blueberry pancakes any time of the year with fresh or frozen blueberries. Beaten egg whites add extra air and lightness, so they turn out fluffy every time. In a separate bowl, sift together flour, baking powder, sugar, and salt. Stir egg mixture into dry ingredients; mix until batter is smooth and stir in blueberries. Cook the pancakes on a hot greased griddle on one side until the edge looks dry and bubbly and the bottom is browned. Flip the pancake and cook the other side until nicely browned. Serve them with maple syrup or a fresh blueberry sauce and enjoy! If you would like to make the batter the night before, refrigerate the unbeaten egg whites in a separate bowl. Make the batter with the flour, baking powder, sugar, salt, milk, and melted butter; cover the bowl and refrigerate. In the morning, beat the egg whites and fold them into the batter and then fold in the blueberries. Pancake batter should be mixed just until all of the ingredients are moistened. Beating the batter will create tough pancakes. For even browning, use a paper towel to rub oil over the surface of the griddle. Too much oil will cause the pancakes to brown unevenly. Sprinkle a few drops of cold water on the griddle to test for heat. If the water dances and pops, it's ready. Chocolate Chip Pancakes: Replace the blueberries with chocolate chips or mini chocolate chips. Toffee Chip Pancakes: Replace the blueberries with Heath Milk Chocolate Toffee Bits. 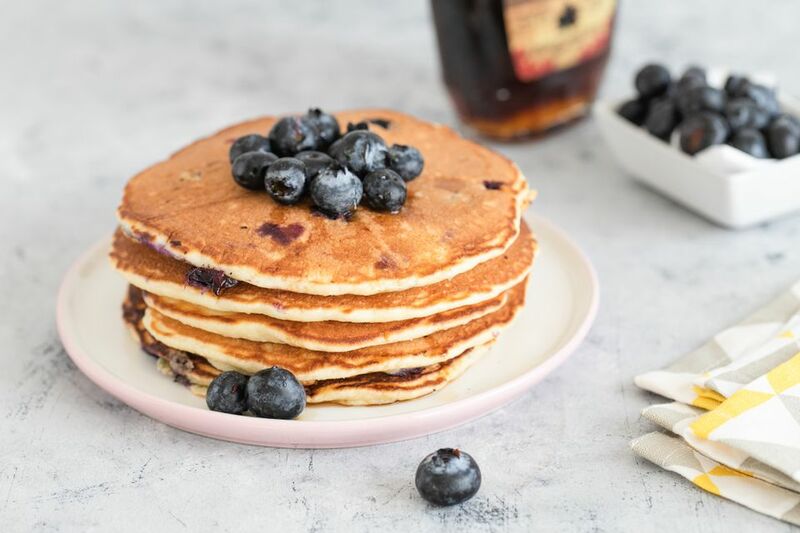 Blueberry Buttermilk Pancakes: Replace half of the milk with buttermilk, decrease the baking powder to 1 1/2 teaspoons, and add 1/2 teaspoon of baking soda. Lemon Blueberry Pancakes: Add 2 teaspoons of finely grated lemon zest and replace 1 tablespoon of the milk with 1 tablespoon of fresh lemon juice.